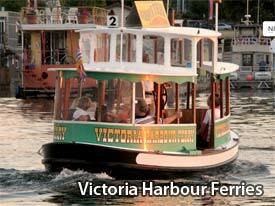 Let us book ALL of your activities for your Victoria vacation! Is there something you want to see or do while you are in Victoria? Let us know and we'll take care of the details. Aside from the natural beauty, Victoria has a colorful history which is preserved in many of the lovingly preserved heritage buildings. Whether you wish to indulge in afternoon tea, take a wind in you hair trip out to see killer whales, or spend the day beach combing, Victoria has something to offer everyone. For complete details and additional information on things to do in the city of Victoria contact the Royal Scot Hotel & Suites where one of our friendly helpful staff members will help you plan your activities and book them for you. This is perhaps Victoria’s most well known attraction. 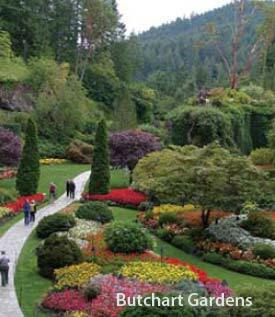 It is a must see for anyone who needs proof that Victoria is the city of gardens. Themed gardens such as the Japanese, Italian and the English rose garden showcase some of the world’s finest landscaping talent. Absolutely immaculate in every way, this will surely be an inspiration to anyone who has even the slightest of green thumbs. Also features fountains and sculptures, as well as a spectacular show and fireworks display (Saturdays in summer season). Restaurants and gift shops completes the experience. National Geographic Theatre is owned and operated by Destination Cinema Canada Inc. Our 408 seat theatre features the 2-D IMAX Experience. The most powerful and involving film experience which brings images to life on a screen over six stories tall with 12,000 watts of IMAX Digital surround sound. Everything else is just a movie! 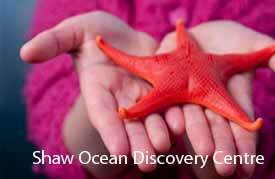 The Shaw Ocean Discovery Centre is designed to provide visitors of all generations an opportunity to gain new insight into the ocean and what we can each do to cherish and respect the ocean ecosystem. Visitors will come to understand the ocean in a new way. The Centre is a place of wonder and exploration and a gateway to nature. This is the original castle built by Robert Dunsmuir. At the time of construction, Mr. Dunsmuir was the richest man in British Columbia. The castle boasts 39 rooms and 5 floors of antiques, stained glass and woodwork from the 19th century. The castle allows visitors a chance to turn back the hands of time and experience what life was like for the very rich in the early years of Fort Victoria. Guided tours are available throughout the day. Built in 1908 by James Dunsmuir this castle is a must see. This was the second castle built by the Dunsmuir family. 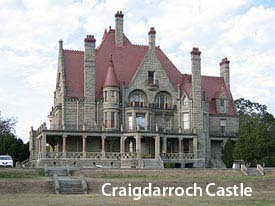 The first, Craigdarroch Castle was built by James father, Robert Dunsmuir. The grounds are beautifully maintained and feature beautiful Italian, Japanese and Rose Gardens as well as a military museum. 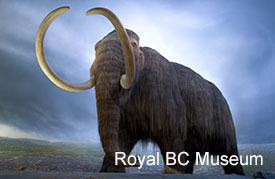 See all of British Columbia at the Royal BC Museum, a world-class museum of natural and human history. Explore our permanent galleries and immerse yourself in tales of where we've been and where we are going. Discover things and people you never knew before at what TripAdvisor users have voted us number one three times in the Top 10 Museums in Canada. Experience authentic artifacts and highly realistic settings -- from the Woolly Mammoth in his rocky, icy world to a tar-scented trip on the HMS Discovery. Stroll through Old Town's wood-cobbled street and enjoy its shops, cinema and railway station. This is the home and birthplace of controversial artist Emily Carr. Carr, who was shunned in her time as being a radical who’s art was often criticized, has now become one of Canada’s most renowned artists. Carr became known for her vivid, life capturing water colours of early BC life. These works featured west coast scenes and images of Early First Nation life that was rarely seen by the average person. A ride in an elegant, white horse drawn carriage provides memories to treasure forever and offers the opportunity for a leisurely look at some of Victoria’s finest scenery. Tours depart from the corner of Belleville and Menzies. Partially because of the English heritage, Victoria is fortunate to have several brew pubs as well as Victoria’s own Vancouver Island Brewery. Vancouver Island Brewery is the maker of several superb lagers and ales located on Government St.
A fun and economical way to see the harbour from the water, the harbour ferries are jaunty little tugs which briskly tour the waterways, stopping at pubs, Point Ellis House and Fisherman’s Wharf. Ferry stop signs line the harbour at many of the piers. Located on the north side of the Empress Hotel, Miniature World is a unique display of intricate scenes in extreme detail. Accompanied by special sound and lighting effects, this makes for an enjoyable experience that you will be sure to tell your friends at home about. The Bug Zoo is very popular with children; it features hundreds of insects from around the world. Entomologists are on hand to answer questions. Not to worry, the insects are behind glass. Come and explore the exciting world of maritime history. It has everything from pirates, to shipbuilding and shipwrecks. Home of the B.C. Legislature, this massive structure, built in 1897 is the focal point of the Inner Harbour. Seen in postcards around the world, the Legislative Buildings are a sight to see at night, when they are outlined with over 3,000 lights. 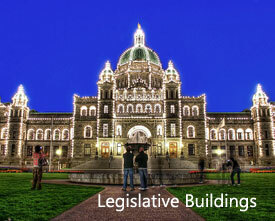 Guided tours run daily and showcase the buildings unique design features and construction, and allow visitors to sit in on a question period to see the BC Legislature at work. Stroll amidst hundreds of exotic butterflies flying free in an indoor tropical rainforest. Witness the entire life cycle of these amazing insects! 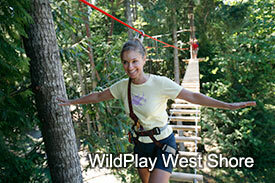 See spectacular flowering plants and foliage, fascinating birds, waterfalls and a stream. This is a photographer's paradise and a truly memorable experience for the entire family. Featuring a mini golf course, farmer’s market, shopping and ice cream, Matticks Farm has something for the whole family! Where else can you pan for gold in 2 pools, with plenty of gold pans to share. Abkhazi Gardens is one of Canada’s most significant garden creations. Prince and Princess Abkhazi created their garden in 1946. “Turning Heads Since 1985” speaks to our innovative vessel design and unfailing attention to passengers’ enjoyment. As Victoria’s longest running and most respected whale watching operator, we have been key to the city’s emergence as a world famous whale watching destination. Our high speed, purpose-built, expedition catamaran is the perfect vessel for providing environmentally responsible whale watching without sacrificing comfort! Our expert staff strives to educate and inspire while practicing sound environmental stewardship in all we do. The information network we administer yields the highest success rate of sighting whales while reducing fuel consumption. We’ve minimized our ecological footprint relative to our competitors. Turn to us for the adventure of a lifetime! At Adrena Line Zipline Adventure Tours, experience an exhilarating ride up to 60km/hr as you soar up to 150 feet off the ground on eight scenic zipline courses ranging from 150 feet to an unforgettable 1000 feet. The tours offered have something for everybody, whether you're with the family or celebrating a special occasion or event. The staff at Adrena Line will pick you up in Victoria Harbour, outfit you with a customized seat harness and equipment and train you on important safety features before leading you into the woods, and on to the adventure. 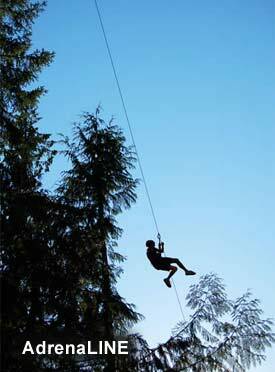 Located in Beacon Hill Park, this has been a favorite for adults and kids alike for generations. With a variety of barnyard animals, the petting zoo gives urban children a chance to interact with their farm friends. Explore some of the world’s best scuba diving, just blocks from downtown. Marine life is abundant in the lush kelp beds. 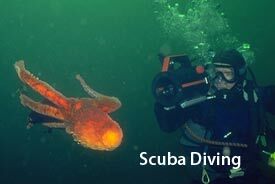 Hundreds of species of fish, otters, seals, octopi and sea floor dwellers are all just breaths away as you enter another world in the wild Pacific waters. This is one of the stops on every divers “must dive” list. The artificial reef society has been busy sinking former navy vessels in the area to provide new areas of exploration. For thousands of years the waters off of Vancouver Island have been harvested for its rich sea life. The commercial fishery was one of the first industries in the area. Today, sport fishing is the main activity on the water. Sport fishing is available year round, but the summer time is the preferred time due to the abundance of salmon. Halibut fishing is also very popular. Halibut of up to 600 lbs have been taken in the local waters. Charter operators are available to take you to some of the best fishing on the coast, just minutes outside of Victoria harbour. Some of them will drop a crab pot on the way out so that in addition to a fresh salmon or halibut, you can have a crab feast if your timing is right. If you prefer to go it alone, boat charters are also available. There are tight restrictions on what you can and can’t keep, so using the skills of a charter operator is recommended. Just let our guest services agent know what you would like to do and we will take care of the rest for you. Spending time on the water is a key part of living or visiting Vancouver Island. Whether you arrive by ferry, or choose to get out on your own, there is no way to avoid the lure of the ocean. There are rentals of everything from one person kayaks to 100 passenger yachts. If you are interested in chartering a boat, just let our guest services agent know and we will take care of the arrangements for you. Please visit http://www.golfvancouverisland.ca/ for more golf information. One of the most popular outdoor activities in the Victoria is the game of golf. The first course in the area was Victoria Golf Club which is located along the ocean in Oak Bay. It is the second oldest course in Canada and is quite a challenge. Membership with another private course is a prerequisite to play this outstanding links style course. If you are interested in playing a round of golf during your visit with us, just let the guest services agent know and we can make the booking. If you need transportation to the course we can also take care of that for you. Below is a list of courses and driving ranges in the local area. 30km Ardmore Golf Course - A full length 9 hole course in good condition. Located on the Saanich peninsula. 19.5kmBear Mountain Golf & Country Club – Nicklaus design 18 hole golf course with full driving range. There is a country club as well as a pro shop on site. It is a par 72 course. 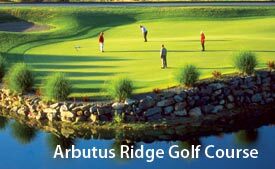 15kmThe Ridge Course - A 9 hole par 3 golf course with beautiful greens, bunkers and water hazards. Also features an 18 hole putting course and a cafe. 5.5kmGorge Vale Golf Club - A challenging championship caliber 18 hole golf course. It's the closest semi-private golf course to downtown. 12kmHighland Pacific Golf - Victoria’s newest public golf course. They have a pro shop and driving range. who are members of another private course. 48kmArbutus Ridge - 18 hole course. The best way to discover Vancouver Island's natural beauty and fabulous wine region is to take a wine tour. Enjoy safe, personalized, round trip transportation from the Inner Harbour to the vineyards. Guests will visit a number of wineries and picturesque sites. Tours will guide you through our favorite vineyards located on Vancouver Island. Leave the driving, directions, stress, and traffic to us while our drivers and wine hosts whisk you away to your perfect day! Victoria has always had a fine tradition of live performing arts. This tradition continues with a variety of venues and performances going on all the time. Built in 1914 this center for concerts and live theater is located at #3 Centennial Square. The lobby houses a display of local and regional visual art. Located in a former church in the Fernwood neighborhood, this theater provides top notch Canadian and international performances in a cozy setting. We would be happy to let you know what is playing during your visit to Victoria, just ask our Guest Services Agent for more information. The Royal Theater is a turn-of the century European style venue. 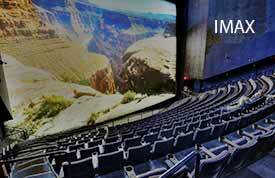 With a seating capacity of just 1400, it’s an intimate theatre that offers a great view no matter where you sit. Book your seats up close to take in the details, farther back for a broader perspective, or in the boxes to see and be seen. Wheelchair seating is also available. The Pacific Opera Victoria puts on 3 productions during October, February and April. The repertoire ranges from light Mozart, Gilbert & Sullivan operettas, and occasional Tchaikovsky. Opened in 1951 as a result of Sara Spencer’s donation of the Spencer Mansion, the Art Gallery of Greater Victoria offers exhibits of all sorts, year round. Special events are also a prominent feature of the gallery and have been known to include activities from art classes for all levels, to evening jazz concerts. Convenient downtown location makes the Bay Centre an easy spot to start your shopping day. With over 100 stores and boutiques, you will be sure to find that perfect gift for the person who has everything. Stores range from novelty to upscale fashions. There is also an upper level food court, 85 ft atrium, escalators and elevators. Our courtesy van is available to take you to the Bay Centre. Just a 10 minute drive from the hotel, Mayfair shopping center offers over 120 stores. Some of the big name stores include The Bay, Toys R Us and The Gap. For your convenience, a food fair, free parking, scooter rentals and gift wrapping are all available. This mall has more than 100 shops and services, located at 1644 Hillside rd, on the corner of Hillside and Shellbourne. You will be able to find everything you’re looking for and more here!! Ask at the front desk or ask a guest services agent on how to get to the mall. Pubs and tea rooms line your route as you stroll through what is considered by many as Victoria’s most British neighborhood. Oak Bay Ave. hosts many shops, boutiques and antique stores. Shoppers won’t want to miss this fascinating stroll which is the heart of downtown shopping. Stroll past a variety of boutiques and specialty shops while taking in the fabulous turn-of-the-century architecture. Start at the Inner Harbour and make your way down the 8 block stretch and finish at the Gate of Harmonious Interest at the entrance of Chinatown. Stores range from bookstores to chocolate factories, from old to new, and are sure to please even the most discriminating shopper. Market Square is located in the heart of downtown Victoria and offers many shops and restaurants. Beacon Hill Park is Victoria’s largest and oldest urban park, covering 185 acres of relatively wild Garry Oak Meadows and neatly manicured flower beds. This park is very relaxing with lovely gardens, many ponds with ducks and birds, an aviary, safe paths and many benches to sit and relax. For the sports enthusiasts there are cricket fields and tennis courts. Guests with us are fortunate this park is only two blocks away. Children especially enjoy the park, as Beacon Hill has an animal farm and petting zoo as well as several playgrounds. The south side of the park borders on the Pacific Ocean. The park also marks Mile 0, which is one end of the 4,849 mile Trans-Canada Highway, the longest national highway in the world. The highway ends (or begins) in St. John’s, Newfoundland. This small but interesting park, adjacent to the Royal BC Museum, is home to some prime examples of Native Heritage. 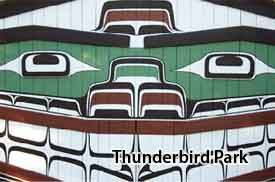 Proud totems surround a ceremonial long house which is the focal point of the park. In the summer months, the park is used by First Nations carvers to display their carving skills to create new totems. It is also used for special occasions, such as the First Peoples’ Festival. A must see for the camera buff. During the gold rush, there were rumors that there was gold in the river on the north side of town. These rumors proved false, but the river got the name Goldstream anyway. Now known as Goldstream Provincial Park, this 388 hectare park boasts an excellent trail system, as well as the Freeman King Interpretive centre. This centre is used to educate visitors about the life cycle of the salmon, which cumulates with the spawning each year from mid-September until late November. Pay Parking & Picnic facilities are available. The park has free maps available to guide you through the trails. There is a 13 km strenuous round trip hike, or several short hikes. For those that want a real challenge, try the hike up to the peak of Mt. Finlayson. Another of the many Capital Region Parks, this is a very popular spot for families as it features a beautiful sandy beach. The park is actually comprised of two Lakes - Upper & Lower Thetis. There is a 4.9 km. trail around lake. The trails are clearly marked with picnic areas along the way. This is one of the best local bird watching areas. It is an easy hike for all ages (no hills). It takes about 2 hr. around lake on well-developed trails. Several ponds and marshes along the way make for great vantage points to see some of the urban wildlife. Witty’s Lagoon provides a sandy beach and an easy hike. 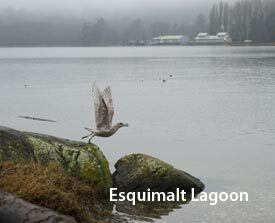 Located in the Bilston Creek Watershed, the lagoon is formed where the fresh water meets the salt water. Here you will find a wheelchair accessible trail, washroom facilities and picnic areas. The tidal lagoon is of particular interest to children or anyone who is interested in sea life. As well as being home to wildlife, the park also has five known archeological sites. The parking lot is located off of Metchosin Rd. These lakes are actually joined at the north end of Beaver Lake, the smaller of the two lakes. Beaver lake is a popular family swimming lake during the summer. There is a playground and concession stand. A level 9 km trail circles both lakes. Elk Lake is the training area for Canada’s Olympic Rowing team as well as host to several competitions each year for the local schools. Elk Lake has a boat rental and is stocked with fish each year. Located off Beach drive in Oak Bay, this popular beach is a great place to see and be seen. Although the water is cold, the beach is sandy, and a large grassy area is great for a game of football or volleyball. Concession stands are open during summer months. This is also the site of the popular Oak Bay Tea Party, which is held on the first weekend in June. Parking is scarce, but busses are easily accessed. This beach is located in Cadboro Bay. The park has a replica of the legendary Cadborosaurus. This creature is said to be a relative of the Loch Ness Monster and lives in the waters of Cadboro Bay. Caddy, as it is known, usually allows itself to be seen once or twice a year. This 59 hectare park is a great spot for walking along the beach and possibly seeing some whales from shore. 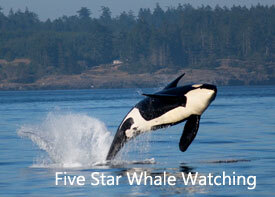 Other wildlife you may see will be otters, seals and Bald Eagles. For directions to the park see Guest Services or follow road signs to Sooke, continue on West Coast Road for about 15 km, the park is on the left.